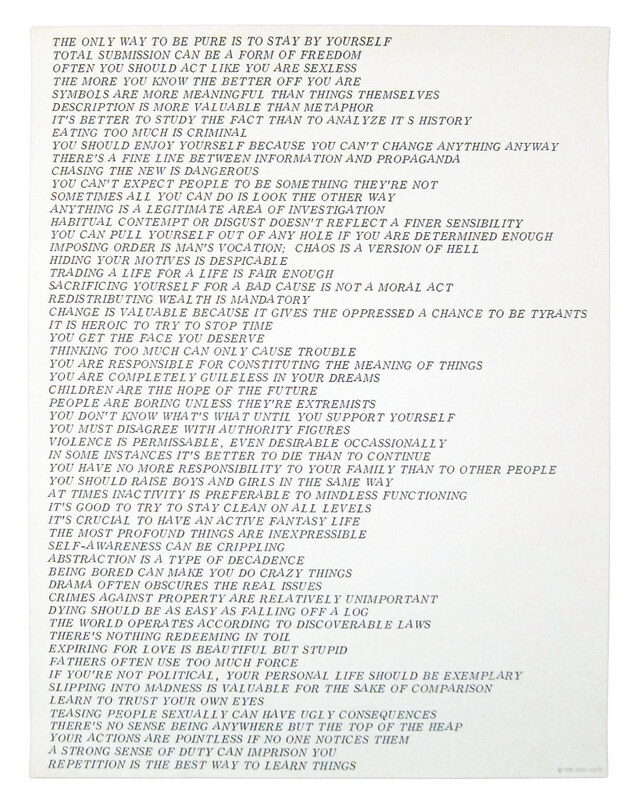 6decadesbooks: Holzer: 'Use what is dominant in a culture to change it"
Holzer: 'Use what is dominant in a culture to change it"
Jenny Holzer’s approach is, as she put it, to “use what is dominant in a culture to change it.” Though her art is almost entirely text-based, Holzer’s methodology is one of appropriation and thus runs in parallel to that of Richard Prince, Jack Goldstein, Dara Birnbaum, Cindy Sherman and others who gained prominence in the late 70s and early 80s, collectively defining a post-modern aesthetic. While they made use of appropriated imagery and photographic modes of working in order to examine and subvert standard ways in which the culture represented itself visually, Holzer was appropriating established linguistic tropes in order to distill received wisdom into a series of basic verbal constructions. Holzer has also been innovative in her use of non-traditional media and modes of exhibition, frequently installing her work publicly as posters, in paid advertising, artists’ books, or, more recently, by using electronic displays and projections, in order to reach an audience well beyond art’s usual museum and gallery settings.